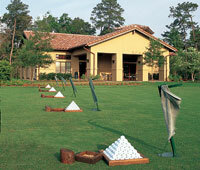 The Club at Carlton Woods is built on the philosophy of honoring the respected traditions of the game. This can be seen in the meticulous preparation of the courses, the development of a thriving caddie program, the view of the game of golf as both a competitive and social pursuit, and the desire to host a prestigious national amateur invitational that provides an atmosphere of spirited competition and camaraderie. Carlton Woods has quickly established itself as a worthy venue for some of amateur golf’s most important competitions. In addition to hosting USGA Open Qualifying (2002, 2003, 2006) and USGA Mid-Amateur Qualifying (2004), Carlton Woods hosted the Texas State Amateur in 2004 and most recently the 2007 USGA State Team Championships. Since opening for play in June 2001, the Nicklaus Course has quickly developed broad regional and national acclaim. The Nicklaus Course was named the 3rd Best New Private Course in the United States by Golf Digest and was most recently rated the #2 Course in Texas for 2006 by the Dallas Morning News and the #5 Course in Texas by Golf Digest. The Fazio Course opened for play in October of 2005, creating the only private club in America with both Nicklaus and Fazio designs. The Nicklaus Course incorporates deep-faced fairway and greenside bunkering, a variety of flanking and frontal water hazards, sandy waste areas and boldly contoured greens into its design. The result is a stern but thrilling championship test. The Fazio Course offers unique elevations from natural marshes to gently rolling terrain, with dramatic bunkering and green undulations. The Zion Zoysia grass tees, fairways and roughs provide ideal playing conditions. All grass surfaces are sandcapped to provide excellent drainage and easier maintenance. The Carlton Woods Golf House is a state-of-the-art teaching and practice facility unlike anything else in the region. In addition to chipping greens, putting greens and practice bunkers, the facility offers three climate-controlled hitting bays and a practice range with bunkered target greens. Video and computer swing analysis is available along with club fitting and repair services. The Golf House gathering room offers players a place to relax, with a large screen TV to take in tournaments and games.